Yep, it's been almost 2 months since the last update. I can barely even fathom how busy I've been. Working 12+ hour days, weekends, etc. has just been seriously stepping in on truck time. I've been able to work on it here and there, but it's been such small steps I felt it wasn't worth writing about. 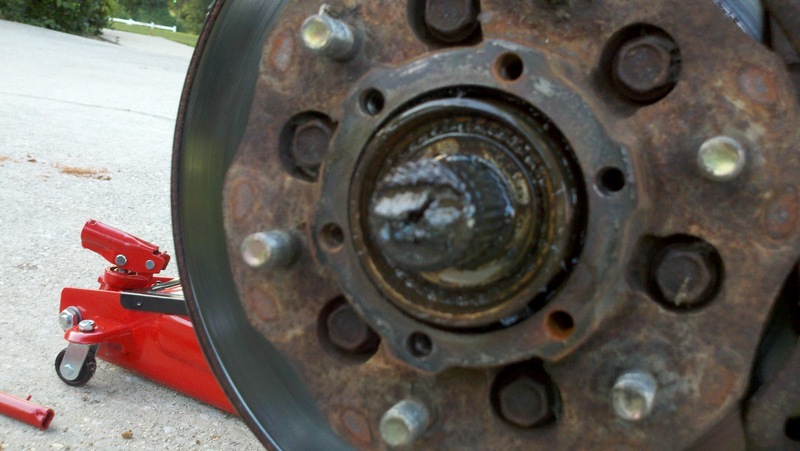 Since the last update, the truck started making a weird noise coming from the front driver's side wheel. Also, the brakes got squishy and the wheels would heat up shortly after driving. Blarg. Parked it for a while until I had time to meet up with some friends and see if we could figure out what's wrong. My buddy Louis came over one evening and we drove it around for a while. 4x4 worked, truck seemed fine, then the noise came. Louis thought it might be the 4x4 automatic hub derping, so we started taking it apart. 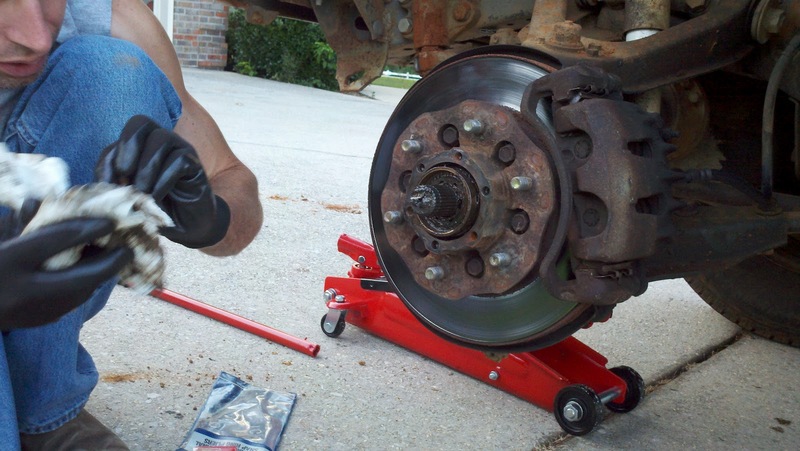 So this was fun, but while we had it apart Louis noticed that basically all the ball joints needed to be rebuilt, and that both of my CV boots were proper jacked. One had been gone for who knows how long, and the other recently burst. 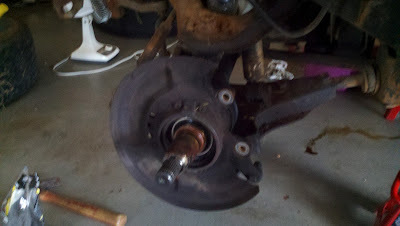 Also the brakes were seized (which I had suspected due to the heat). 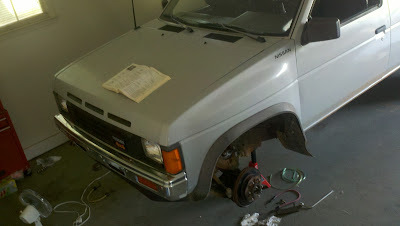 Began to suspect something may be wrong with the CV or bearings, but taking the hubs and all apart was going to take more time than we had, so we put it back together and it sat for a few weeks. Later, I got permission from dad to park The Beast in the garage for prolonged work. 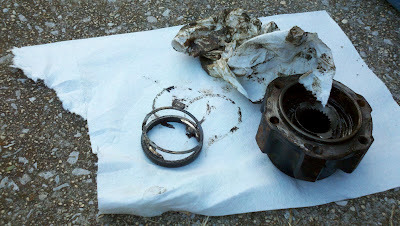 Popped off the wheels, 4x4 hubs, etc. 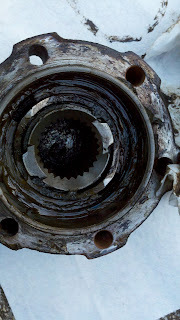 and noticed the brake pistons were indeed stuck engaged. We dinked around with these for a while, and eventually got them loose. 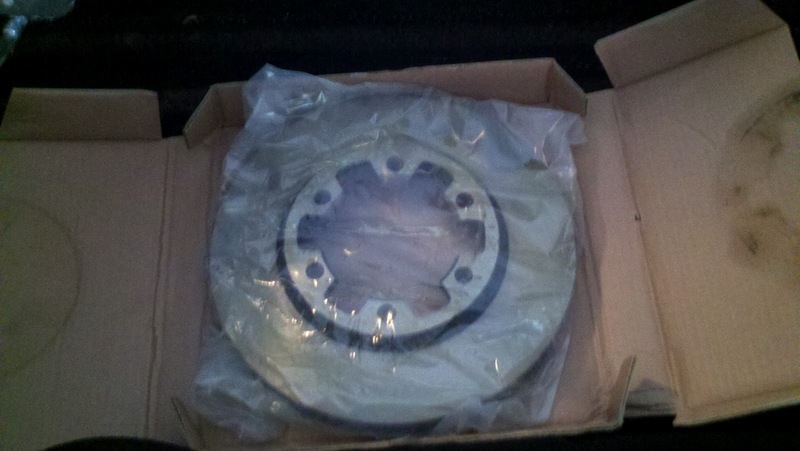 Purchased caliper rebuild kits. 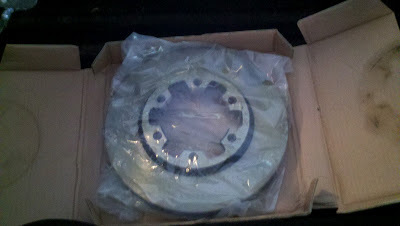 The rotors were pretty worn and somewhat jacked up from the seized piston, so I went ahead and got new rotors as well. 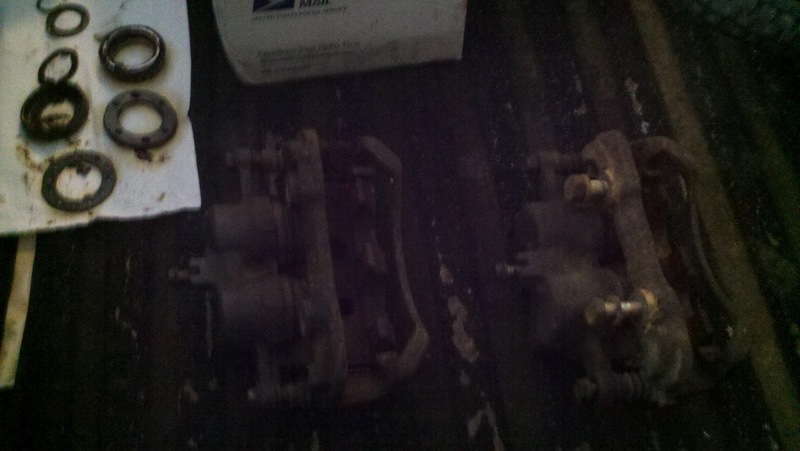 Also bought all new ball joints. All this stuff together was less than $150 :) Getting the hubs and rotors separated was tough... took several minutes on each one with a 3lb hammer to get those things loose. 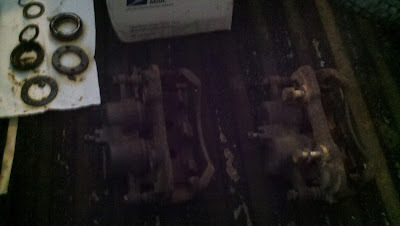 Also got the cotter pins out and the nuts off the ball joints of the steering arms on both sides. Going to have to find a ball joint press to rent/borrow to actually get the arms loose. In the meantime, there was audio to be worked on. I got a set of Infinity 6.5s to match the fronts. The factory rear speakers have a nifty little blue housing around the grille, and I actually like the way they look, so I wanted to keep that as close as possible. 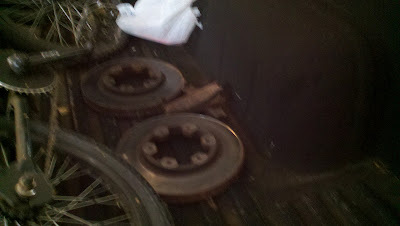 The rears apparently were blown out at some point, either way neither of them worked when I got the truck. To keep the factory blue piece and whatnot required some serious Dremel work, a lot of patience, and even more time. 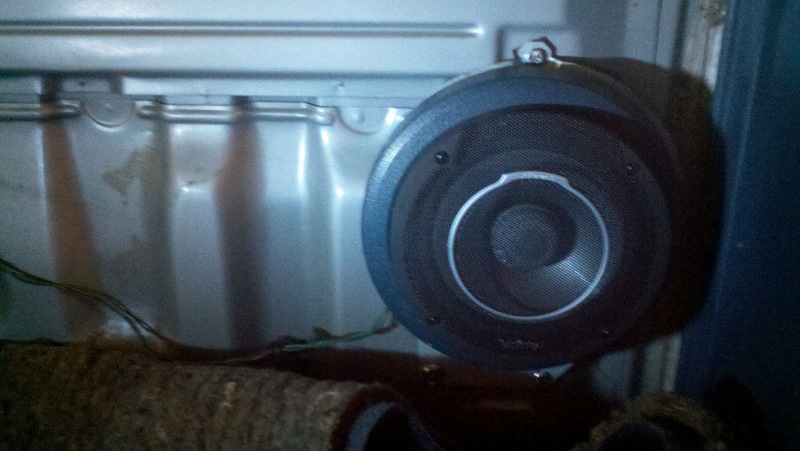 Here's what the factory speakers looked like. Not bad by any means, but this one is pretty dirty. I liked the look and wanted to keep it pretty close to stock. The Infinity speakers though, of course, have significantly larger magnets. 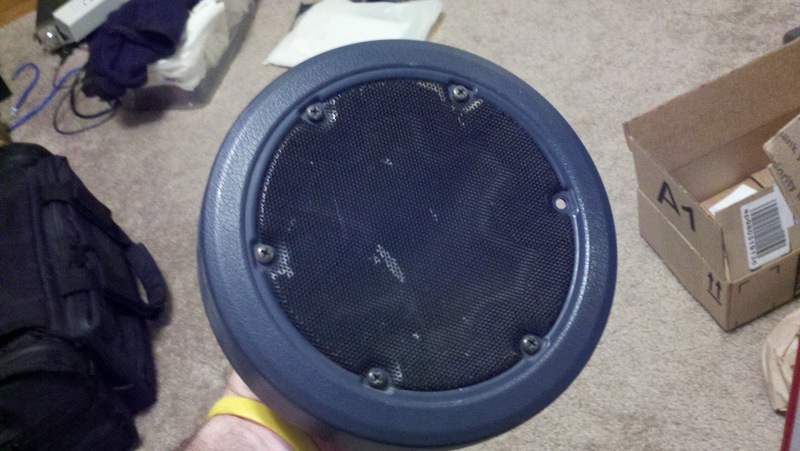 In fact, the magnets touched the back of the cab, so I had to make some plastic spacers to put in between the bracket that mounts to the cab and the cab wall itself, then put spacers between the speaker and the bracket, which were just thick enough for the blue trim to fit in between with some careful Dremel work. Since this was the first run, I forgot to take pictures of what I did, but I'll definitely do that on the next go round. I'm really happy with how it turned out. The Infinity speaker definitely looks more legit. Not very 80s, but they just sound awesome. As I make the next one I'll take progress pictures. It takes a lot of work, but I think it's worth it. There's carpet against that cab wall too BTW, but I won't be putting that back up until the speaker work is done. So yeah, right now The Beast doesn't move, but is getting closer and getting some much needed parts replacements anyway, so the next time it's up and running it should be better to drive than before.